Long before the veritable blitz of Orientation and rush events, and before all 1,039 freshmen arrive on campus, pre-orientation and special orientation programs have given several hundred incoming students an early glimpse at MIT life. Freshman Pre-Orientation Programs (FPOPs) attracted 250 first-year students this fall, while Project Interphase and International Student Orientation each drew roughly 60 freshmen. “The number of participants in the Freshman Urban and Arts Programs, two of the FPOPs, is on target for what we wanted this year,” said Orientation Coordinator Trisha M. McAndrew ’03, who is responsible for the oversight of all the pre-orientation programs. Coordinators were aiming to increase their numbers from last year. Sponsored by the Office of Minority Education, Project Interphase is a seven-week program which includes instruction in physics, writing, physical education, chemistry, calculus, and other activities. Application to the program, which is free of charge, is open only to underrepresented minority freshmen. “Project Interphase allows you to enter your freshman year in the right mind set,” said Interphase student Israel Reyna ’05. Most participants enjoyed making friends before August Orientation and appreciated the opportunity to explore the MIT campus. “I’m getting a head start on my MIT career, familiarizing myself with the campus, and getting to refresh my mind on classes,” Tolbert said. “You get a real feel for the system of MIT,” said Jennifer A. Moore ’05. International undergraduate orientation, which began Monday, has given many foreign freshmen their first taste of life at the Institute. “It’s a nice place; there are a lot of friendly people here. I hope I’ll still like it when I have classes,” said Dumitru Daniliuc ’05. “I’m excited, but at the same time, I didn’t get much of a vacation -- only two months, because of MIT’s schedule,” said Nada Amin ’05 of Switzerland and Bahrain. At Amin’s former school, classes traditionally begin in October. Yet some first-year students have already sensed the oft-chaotic atmosphere of rush and Orientation. Although MIT staff sometimes provide help -- international student orientation, for example, receives aid from the International Students Office -- the programs are run mostly by student volunteers. “In the past there has been little or no faculty/staff involvement [in pre-orientation programs],” McAndrew said. Yet Assistant Dean for Student Activities Tracy F. Purinton advised the Freshman Leadership Program this year, while four MIT staff members -- Rev. John Wuestneck, Sgt. Cheryl Vossmer, Carol Matsuzaki, and Jason Wall -- were involved in the Freshman Outdoors Program. This year’s Freshman Leadership Program (FLP), a retreat to Eagle Pond Lodge in Danbury, New Hampshire, attracted 102 new freshmen. The program, led by Sudeb C. Dalai ’02, Colin T. Galbraith ’03 and Laura K. Kieckhefer ’02, aims to explore the connections between leadership and community. 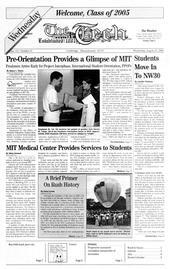 The first pre-orientation program to be installed at MIT, FLP was founded in 1996. The Freshman Arts Program (FAP), led by Fred W. Choi ’02 and Bess D. Rouse ’02, drew around 60 participants. FAP, which offers an array of arts workshops ranging from miming to songwriting, is meant to introduce incoming freshmen to arts opportunities at the Institute. The program revolves around five disciplines: dance, theatre, visual arts, music, and film and media. Goutam G. Reddy ’02 and Jennifer Li ’02 coordinated this fall’s Freshman Urban Program (FUP), whose enrollment totalled about 50 participants. The Freshman Urban Program provides participants with a variety of opportunities to explore urban issues and community. McAndrew coordinated the Freshman Outdoors Program (FOP), which aims to bring freshmen together in an outdoor environment to promote “community, self-discovery, relationship building, and, of course, fun,” according to the program’s description. Roughly 40 first-year students were involved in FOP. Instead of the participation in Outward Bound that marked last year’s FOP, this year’s outdoors program involved hiking, whitewater rafting, rock climbing and camping in New Hampshire and Maine.